Medal "I.D. Putilin" Established on 20 April 2017. Awarded to employees of bodies of internal affairs for special services in the organization and implementation of operational and investigative activities, for a significant contribution to the fight against criminality and the detection of crimes, for scientific and technical support and the training of qualified personnel for the operational divisions of bodies of internal affairs. 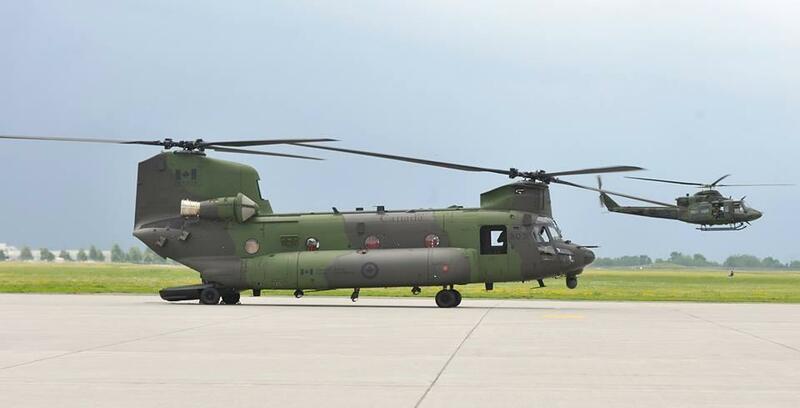 I believe the top row contains 5 ribbons of varying widths: 2, 3 and 5 from the Russian MoD. The 1st ribbon might be the state Jubilee Medal "300 Years of the Russian Navy", it would explain its position in front of MoD awards. The only similar ribbon known to me is for the Soviet Order of Bogdan Khmelnitsky 1st class and I find that quite difficult to believe considering the absence of any related WW2 ribbons. The 2nd is the Medal "For Military Valour" 2nd Class, the 3rd is from the Russian MoD but not clear enough for a positive ID, the 5th looks like the medal for 150 Years of Railway Troops of Russia. 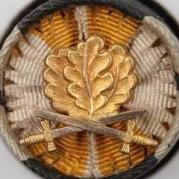 The bottom possibly contains 4 ribbons also of varying widths, my guess would be public awards (unofficial). 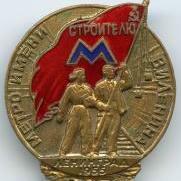 Medal "Marshal of the Soviet Union A.M. Vasilevsky" (Медаль «Маршал Советского Союза А.М.Василевский») Awarded to officers of the General Staff of the Armed Forces of the Russian Federation and officers of operational directorates, divisions (departments) of the branches of the Armed Forces of the Russian Federation, of military districts, of the Northern Fleet, of arms of the Armed Forces of the Russian Federation, for exemplary performance of military duties and high performance indicators, with service of 10 years or more. The medal may also be awarded to citizens who are in the reserve or retired, for previous military service in the General Staff of the Russian Armed Forces who have served in the military for 25 years or more, as well as to other citizens of the Russian Federation, for assistance in solving the tasks assigned to the General Staff of the Russian Armed Forces. ---------------------------------------------------------------------------------------------------------------------- Medal "Army General Shtemenko" (Медаль «Генерал армии Штеменко») Awarded to officers of the General Staff of the Armed Forces of the Russian Federation, to military and civilian personnel of the organs of organisational mobilisation of the Armed Forces of the Russian Federation or of structural units for the protection of State secrets of the Armed Forces of the Russian Federation, who served (worked) in organs of organisational mobilisation of the Armed Forces of the Russian Federation, in military commissariats, in structural units for the protection of State secrets of the Armed Forces of the Russian Federation, for a minimum of five calendar years: for great personal contribution to mobilisation readiness of the Armed Forces of the Russian Federation, for the organisation and participation in activities aimed at the mobilisation readiness of the Armed Forces of the Russian Federation, for the implementation of activities aimed at the protection of State secrets of the Armed Forces of the Russian Federation. The medal may be awarded to citizens of the Russian Federation who have served (worked) in organs of organisational mobilisation of the Armed Forces of the Russian Federation or of structural units for the protection of State secrets of the Armed Forces of the Russian Federation, with a total service (work) time of more than 25 calendar years, it may also be awarded to sympathetic citizens of the Russian Federation for assistance in solving the tasks assigned to the organs of organisational mobilisation of the Armed Forces of the Russian Federation or of structural units for the protection of State secrets of the Armed Forces of the Russian Federation. Medal "Army General Yakovlev" (Established on 23 January 2018 by Order 17) Awarded to servicemen (with greater seniority and rank), employees (with greater seniority and rank), federal state civil servants, troops of the National Guard of the Russian Federation, temporarily replacing in military managerial positions (commanders, directors) of structural units of the central office of the National Guard of the Russian Federation, operational-territorial associations, formations, military units of the troops of the national guard, territorial bodies of the National Guard of the Russian Federation, organizations of higher education and other organizations of the troops of the National Guard and their deputies, as well as those who pass military service (service) in posts related to management of subdivisions, with at least 3 years in those positions: for the able leadership of military units (organizations) which contributed to the achievement of high performances in combat service and operational-service activities; for high professionalism shown in the management of military units (organizations) in the performance of combat service and operational-service tasks. May also be awarded to other citizens of the Russian Federation for assisting managers (commanders, directors) of military units (organizations) of the troops of the National Guard in carrying out the tasks assigned to them. The Russian State Courier Service awarded some very attractive badges to denote its last 2 jubilees. Firstly, for 210 Years of Russian Courier Communications. Established on 22 July 2005 by Order 250 and awarded to employees of the State Courier Service of Russia, for exemplary performance of official duties, for achieving good results in service (work), and to mark the 210th anniversary of Russian state courier communications. May be awarded to other persons for assistance in solving the assigned tasks of the State Courier Service of Russia. And more recently, for 220 Years of Russian Courier Communications. Established on 2 August 2016 by Order 241 and awarded to employees of the GFS of Russia who have served (worked) in the state courier system of Russia for not less than 1 year: to officers of the bodies of federal courier communications for initiative, diligence and excellence in performance; to federal civil servants who occupy posts in the state civil service in bodies of federal courier communications for excellent and efficient civil service; to employees of territorial bodies of the GFS of Russia for the faithful performance of duties; to other persons for assistance in solving the tasks assigned to the GFS Russia. Plain reverse with screw back. Is there no limit to your talent... Marvelous pieces!! Still nada... So many were made. And the way they were bestowed at first, there was no way to regain control. New MVD of Russia medal: Medal "For strengthening international police cooperation" Established on 20 April 2017 by ministerial order 220. 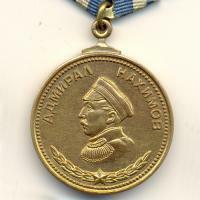 Awarded to employees of law enforcement agencies, federal state civil servants, employees of the Ministry of Internal Affairs of Russia and, in some cases other persons, for significant contribution to strengthening and developing cooperation with law enforcement agencies of foreign states and International organizations. Tell me if you need help with translation. I go on SAMMLER.RU almost daily. But had missed the 2nd link. Thanks! Francois, check it out: I asked the guy in the thread and he confirmed the symbolism of the white-blue-red gems. A new medal established by popular demand and approved by minister Shoigu in November 2016. Medal "Veteran of the Armed Forces of the Russian Federation" Est. 2016-11-24 order № 770. Awarded for many years of honest service in the Armed Forces of the Russian Federation if previously awarded state awards of the Russian Federation (or of the USSR), or awarded the Russian Federation Presidential Certificate of Honour or of Gratitude, or if awarded two or more Defence Ministry of the Russian Federation departmental decorations, and having served with no disciplinary problems for 25 years or more in calendar years at the time of retirement from the military. It is here with its Soviet predecessor and the Soviet medal for veteran of labour. 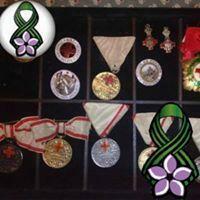 I find it odd the ribbon chosen is more similar to the the Soviet civilian than the military medal.